WASHINGTON — The Trump administration, invoking national security powers meant to protect the United States against threats from abroad, announced new rules on Thursday that give President Trump vast authority to deny asylum to virtually any migrant who crosses the border illegally. Administration officials declined to say who will be affected by the new rules, but it is widely expected inside the government and by advocate groups that Mr. Trump intends to deny asylum to migrants from Central American nations, some of whom are marching toward the United States in a widely publicized caravan. The president, who made immigration and the caravan major issues during the midterm election campaigns, is expected to announce on Friday which countries the rules will apply to. They will go into effect on an emergency basis as soon as they are published in the Federal Register. The regulations will overhaul longstanding asylum laws that provide the opportunity for people fleeing persecution and violence in their home countries to seek sanctuary in the United States. The changes effectively close the option of asylum to those who do not enter the country at an official port of entry, where immigrants and other travelers are legally allowed to cross from Mexico into the United States, after being processed by the Border Patrol. Recently, at some crossings, a crush of arrivals has created long lines and delays of several days. The new regulations draw upon the same authority Mr. Trump used to ban travel from several predominantly Muslim countries only days after his inauguration and are certain to be challenged in court. Lawyers for immigration advocacy organizations said they violated a founding principle of federal asylum: to judge each person’s asylum claim on its own merits. And the lawyers said federal and international law made it clear that the United States must provide immigrants the opportunity to claim asylum regardless of whether they entered the country legally or illegally. Trump administration officials defended the new approach, saying the president is responding to statistics that show that most migrants who seek asylum are eventually denied — but not before many of them skip their court hearings and choose to illegally stay in the United States. Once the president makes a proclamation identifying who is barred by the new regulations, an official said, those people could apply for two other, smaller programs that are much less likely to result in them being allowed to stay in the United States. An administration official who briefed reporters said the two programs would satisfy the United States’ treaty obligations — a claim critics say is not true. The official, who spoke on the condition of anonymity to provide details of the rules before they are published, said the new regulations were supported by laws that gave the president broad authority to control who entered the United States. Mr. Trump has fumed at his advisers for months about the surge of immigrants crossing into the United States from Mexico. 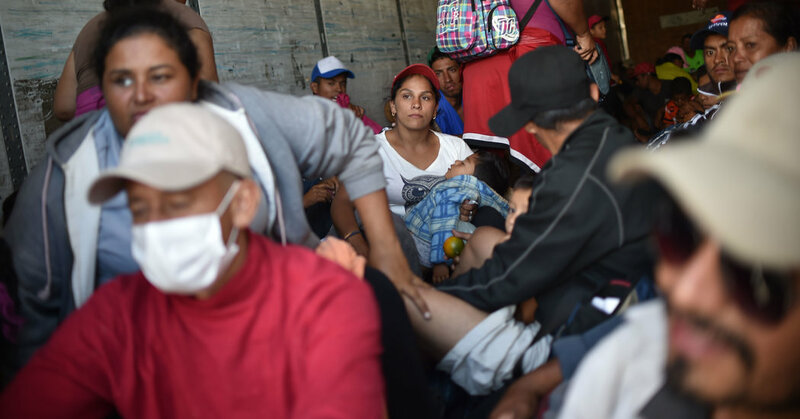 Enraged by the caravan of several thousand migrants that began forming in Honduras and has been slowly making its way to the United States-Mexico border, he ordered more than 5,000 active-duty troops to the border to prevent the migrants from crossing. By early this week, that caravan still had about 4,000 or 5,000 people and had made it to Mexico City. Smaller caravans of several hundred people each are reportedly also headed toward the United States. Since taking office nearly two years ago, Mr. Trump has railed against what he calls weak laws that allow migrants who are caught crossing illegally to claim asylum under false pretenses and then be released into the United States, sometimes for years, as they wait for the courts to determine the validity of their asylum claim. In the fiscal year that ended in September, 396,579 people have been apprehended after crossing the southern border illegally, officials said. The new rules are meant to help bring an end to “catch and release” by declaring large groups of migrants ineligible for asylum. Those who cross illegally into the United States and try to claim asylum would be detained and quickly returned to their home countries. Thursday’s asylum changes are part of a concerted, governmentwide effort by Mr. Trump and his hard-line aides, including Stephen Miller, the senior domestic policy adviser in the White House, to drastically reduce immigration by enacting broad changes to the nation’s laws. In addition to the travel ban, Mr. Trump has severely scaled back the number of refugees who may be allowed into the United States from around the world. And he has proposed rules that would punish legal immigrants by denying them green cards if they use public benefits like food stamps and housing vouchers. His administration has also tried to shut down the longstanding Temporary Protected Status program, which is intended to provide temporary relief for people from countries like Haiti, El Salvador and Honduras who have been devastated by natural disasters or political strife. And Mr. Trump has ordered an end to the Obama-era program known as Deferred Action for Childhood Arrivals, or DACA, which is meant to shield about 1.8 million young immigrants from deportation and provide them permits to work legally in the United States. Courts have temporarily blocked the government from ending DACA, saying the administration has not provided a legitimate reason for wanting to do so. On Thursday, an appeals court upheld a lower court’s decision to keep the program running. The Supreme Court is expected to take up the case this term. Mr. Trump’s attempts to shut down the Temporary Protected Status program have also been blocked by courts. But after more than a year of legal wrangling, the Supreme Court upheld the third version of the president’s travel ban in June, allowing it to go into effect. Taken together, the Trump administration’s immigration efforts have attempted to drastically slow the flow of immigration — legal and illegal — into the United States. The assault on asylum is part of the administration’s response to a sharp increase in the number of families from Central America who are attempting to cross the southern border. In September, the Border Patrol apprehended 16,658 people in family units, a record figure. Last April, the Justice Department began carrying out a “zero tolerance” policy at the border, prosecuting all adults caught crossing it illegally. That led to a policy of separating children from their parents and a political scandal that forced Mr. Trump to back down. But officials at the Department of Homeland Security and the Justice Department have been working overtime since then to develop a range of new policies to stem the flood of families from Central America. The formation of the migrant caravan now near Mexico City fueled Mr. Trump’s ire and prompted him to make stopping it a central closing issue in the midterm campaign. Sensing that it would be a powerful political motivator for some Republican voters, he repeatedly promised to take action to change the asylum laws.